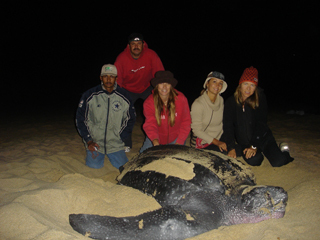 Volunteering for Sea Turtles in Todos Santos is the Eco Adventure of a lifetime!! 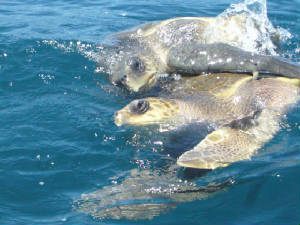 Help population recovery, participate in marinelife research, and experience Mexican culture! Our Volunteers are trained in collecting data on nesting sea turtles, nest relocation, incubation greenhouse operation, nest excavation, and hatchling releases. Early morning patrols are run on ATV's, evenings are spent releasing hatchlings, and days can be spent monitoring the incubation area, caring for hatchlings, helping with beach clean-ups, designing publicity, snorkeling, or simply relaxing. There are lots of beautiful beaches to explore in the area, as well as a culture-rich downtown full of shopping, dining, and art galleries. Three species of endangered Sea Turtles nest on the beaches of Todos Santos: Olive Ridley, the critically endangered Leatherback, and occasionally the Black sea turtle. 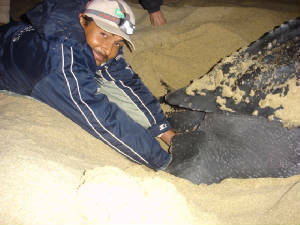 Beginning in October when Leatherbacks arrive to nest, the sand temperature drops below the necessary 26 degrees celcius required for successful incubation. For this reason, Biologists and Technicians relocate sea turtle nests to a special Incubation Greenhouse designed to Increase the temperature and hatchling yeild. Approximately 100 nests are relocated to the greenhouse each season. Volunteers supervise the incubation areas, care for hatchlings before their release, are trained in nest escavation, and help manage the hatchling releases. We work with each of our Volunteers on an individual basis to design a program that fits your interests and needs. Volunteers can work various shifts depending on the month of participation. Nest Relocation Patrols are run late at night and in the early morning October - March. 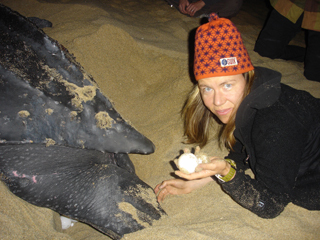 You will be trained in recording physical data on nesting turtles, nest collection and relocation. Daytime duties include: Incubation supervision, Recording Greenhouse temperatures, Caring for hatchlings, Nest escavation and Hatchling releases (Releases take place November 30- April). There are many on-going Volunteer activities that take place throughout the year and we are open to you receive your ideas. You may work as little as four hours each day, or up to 10 hours if you desire. 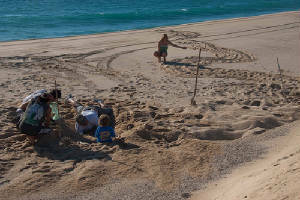 You can also take days off to relax and explore Todos Santos on your own. The Volunteer Casitas are conveniently located between the beach and centro, with several markets and restaurants within walking distance. 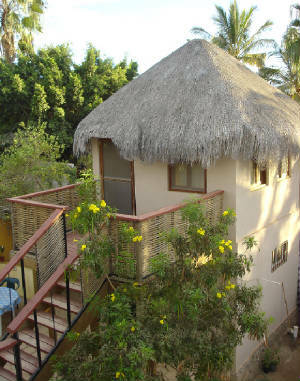 The property is gated and each Casita has a locking door and private bathroom with hot water. There is a large palapa covered kitchen and common eating area. Volunteers will be coming and going at different times, and so can choose to prepare meals individually or as a group. There is wi-fi, so bring your portable internet device. 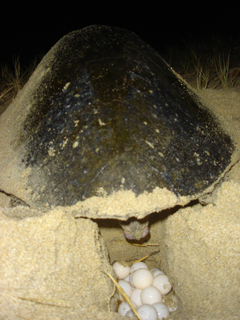 Volunteers can elect to be woken up and taken to the nesting site if a turtle is on the beach during your night off. After submitting your registration below you will be taken to a page to reserve your Casita. Anyone can volunteer, we accept individuals, couples, families and groups. We can verify hours of work for interns and University students. Spanish language skills are not required, but if you would like to brush up on your conversation skills, private lessons are available. We are currently accepting Volunteer registrations for the upcoming season. When is the Best Time to Volunteer? 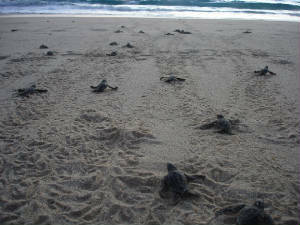 December 1 - February is our busiest season, with Hatchling Releases every day, and nesting turtles several nights each week. February - April there are Hatchling Releases 3-6 days per week, and we still need many volunteers as the greenhouse must be supervised throughout the day every day. Nightly patrols continue, but nesting begins to taper off to just a couple times per week. 90% of the Pacific population has been wiped out by long lines and gill nets. 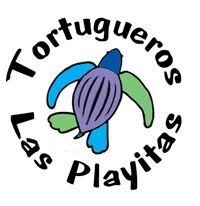 Without the Incubation Greenhouse, Leatherback nests in this region fail to incubate due to low temperatures. La Sirena Eco-Adventures sponsors the project through use of our ATV, Biologist housing, and Volunteer management. If you are interested in Volunteering, please contact our Volunteer Coordinator for more information or resreve your space in our Volunteer Casitas.